SHERI LEE MILLER: On the Royal Mile, with coffee, looking especially sassy. As of this morning, when we watched Sheri Lee Miller climb into a cab and head off to the Edinburgh airport and her flight home to California, Team Wretch is now down to four. As the director of ‘Wretch Like Me,’ the plan was always to have Sheri here for just the first week, to get the show up and running and help get our publicity and media connections established. It was a good thing she was here, because from the beginning, we’ve needed her director’s eye. There were technical issues. The stage turned out to be not as high as we’d expected, and Sheri needed to re-think and re-block portions of the show. 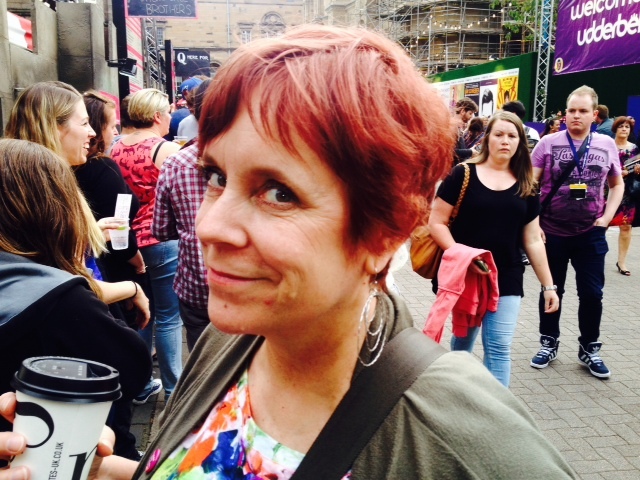 She’s also guided several other elements of the whole being-in-Edinburgh thing, including taking a strong position on how we should best use the outdoor stage spots the Fringe delegates to some companies, intended as a place to promote your shows to passersby on the Royal Mile. So, in short, along with directing the show over the last several months and everything she’s done to encourage me and support the road to Edinburgh, Sheri has been absolutely invaluable. And now she’s on her way home. And Team Wretch has just under two more weeks in Edinburgh. And another show in less than three hours.